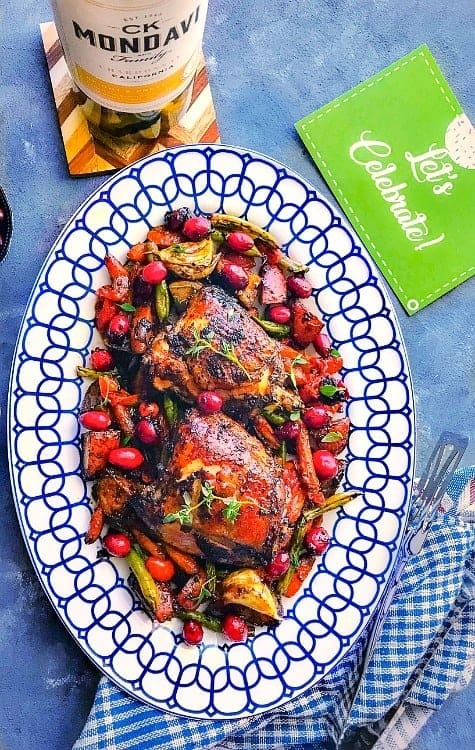 Quick Oven Roasted Balsamic Chicken with Vegetables: chicken with colorful vegetables marinated in a sweet-spicy-tart mix. Then slow roasted to an evenly cooked, tender chicken that’s juicy in every bite and giving a perfect glaze along with flavor to the vegetables. 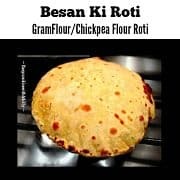 * The GlutenFree recipe is ready in 45 minutes and can serve 4 people, however, it can be easily doubled or tripled or even quadrupled as per need and can be made in advance too. Christmas is right around the corner and that means lots of parties, food, drinks, gifts, and decorations. We are almost done with the decoration – gift part and right now working on our final Christmas Day menu. No matter what we have on the menu, this Quick Oven Roasted Balsamic Chicken with Vegetables paired with wine is one recipe that has been a constant feature in all our Christmas celebrations over the years. 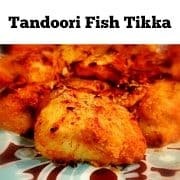 It’s one recipe that everyone wants, from our family, friends to even our neighbors – So WE GOT TO HAVE IT!! 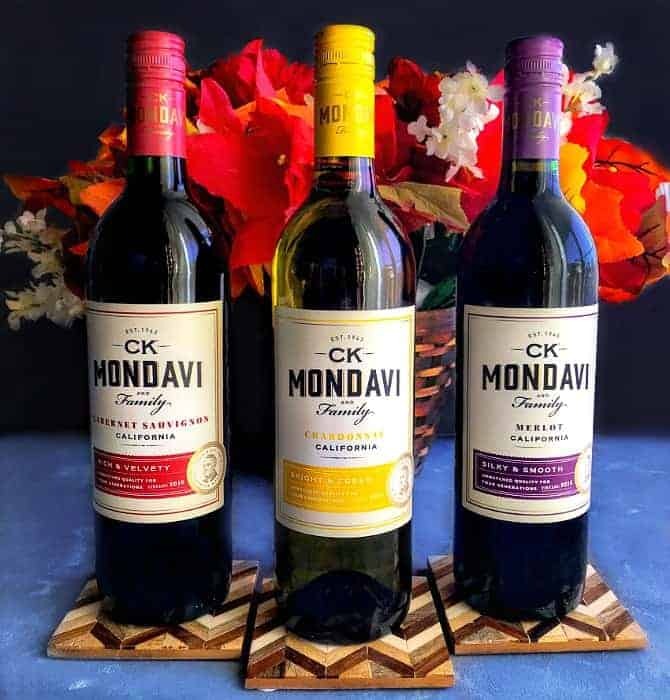 Talking about family, I also wanted to share this Awesome – Exciting news with you’ll that I’ve joined CK Mondavi and Family as a Brand Ambassador. That means I’d be sharing creative/delicious recipes paired with their award-winning wines from time to time. I’m pairing this roasted dish with their Bronze Award Winner (Tastings 2016 World Wine Championships) Chardonnay from CK Mondavi and Family. 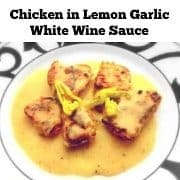 The wine is medium-bodied with the ‘ aromas of lemon and citrus combined with flavors of apple and pear leading to a delightfully crisp finish ‘ and goes perfectly with the roasted meat n veggies. That’s not the only award this wine has won, it’s been also the ‘Best Buy’ 2015 award by the Beverage Tasting Institute. 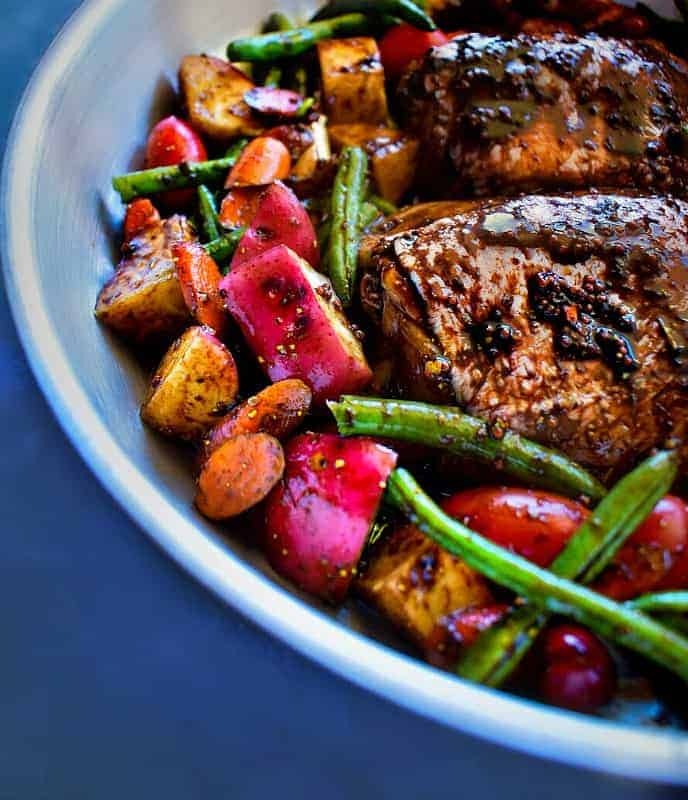 Now, getting back to our Quick Oven Roasted Balsamic Chicken with the vegetable recipe. Tt’s extremely easy to prepare, just chop, mix, marinate (for 5 minutes) and then roast in the oven – that’s it. The result is this incredibly scrumptious, fingerlicking good recipe with umami flavors. The most important part of the recipe is the ‘marinade‘!! 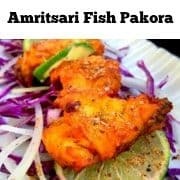 It gives this dish so much flavor and takes your everyday chicken and vegetables to a whole new level of deliciousness. However, you can substitute with any vegetable of choice. Chicken is a lean meat and loses it’s moisture upon cooking, hence to keep it succulent, you need either skin-on-chicken or use butter or thick oil to help keep the chicken moist while it roast or pan sears. Adding a layer of marinade or some kind of juice also helps chicken get some extra moisture and cook tenderly. This helps in locking the moisture while it slowly and evenly roasts the chicken. Also, slow roast results in even browning of the chicken. This is an EXTREMELY important step as this results in an extremely glossy and juicy chicken. Once your chicken is ready, simply brush it lightly with the same marinade or butter. Just keep it back in the oven for 2 minutes while the moisture gets absorbed and serve. 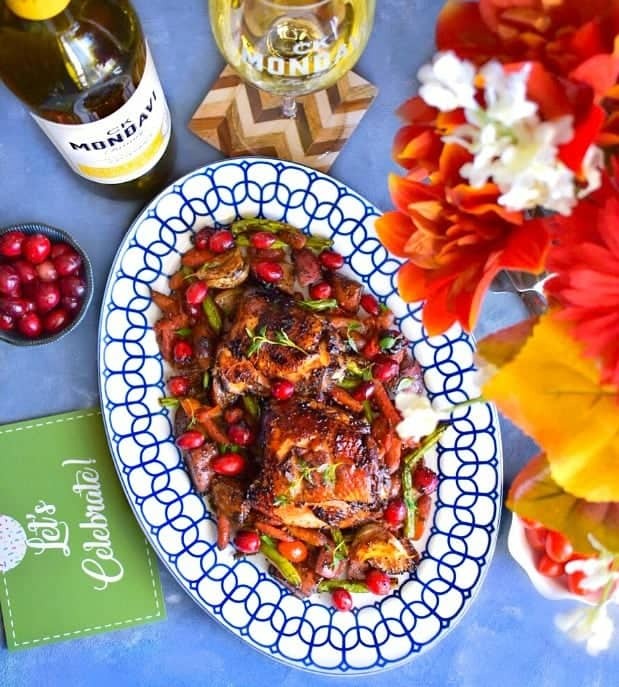 That’s it from my side this week and hope you try this chicken along with CK Mondavi and Family wines for that perfect family meal this festive season. If you like red wines more, you can even try the CK Mondavi and Family Merlot or Cabernet Sauvignon as they go perfectly with this dish too. 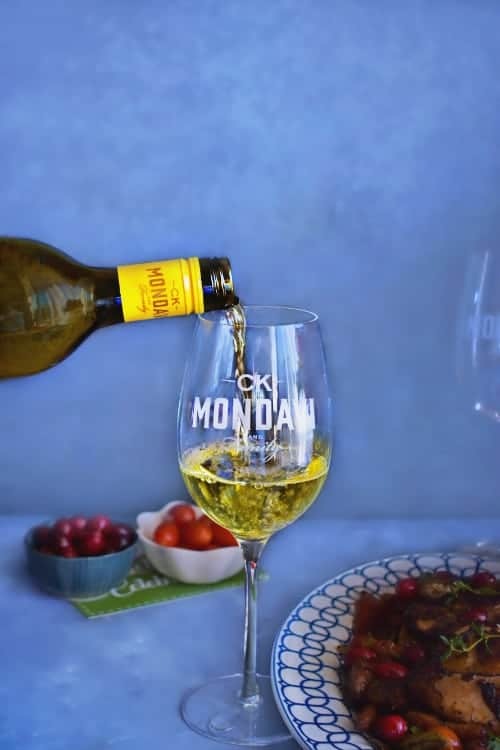 Here’s to Good Times, Delicious Food & Amazing Wines from us at EasycookingwithMolly and from the CK Mondavi Family (picture above). In a large bowl (that can hold all veggies) add all the marinade ingredient and mix evenly. Add the chopped vegetables in the marinade and mix evenly (you can leave this for 5 minutes). Now, remove the vegetables from the marinade and add chicken thighs in the remaining marinade (leave this for 5 minutes). Take a large oven safe skillet/pan, drizzle 1tbsp oil. Place the marinated chicken thighs in the middle of the pan and arrange the marinated veggies around it. Brush the chicken with any remaining marinate mixture. Bake chicken for 30-35 minutes or until juices run clear. Turn off the oven and cool slightly. Plate the chicken and vegetables in serving platter and sprinkle some fresh thyme on top. 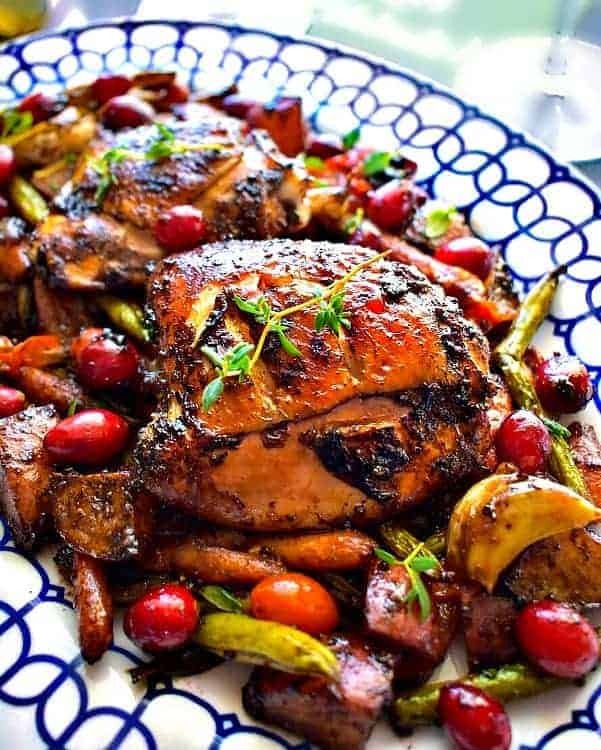 25 Replies to "Quick Oven Roasted Balsamic Chicken with Vegetables #onepot"
What a beautiful meal! This surely doesn’t look like it’s something fast or easy but IT IS! Even though I don’t eat meat, that looks amazing! I’ll have to share the link to your recipe with my best friend. He’d love it! 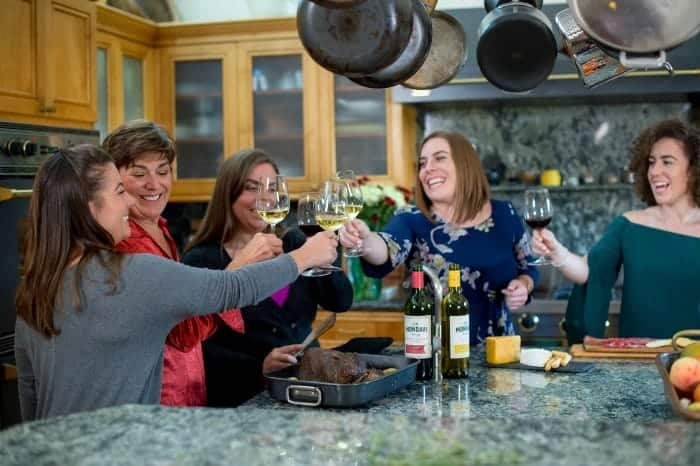 I love cooking with wine, which means drinking it while I cook or using it in my recipes. I also love a simple, flavorful recipes I can create any night of the week. I love that this just takes a bit of chopping and 5 mins of marinating and you have a fabulous meal ready to go. I am always at a loss when it comes to pairing wine with a great dish like this. I will try these Mondavi wines as gifts when going to houses this season. I always struggle with walking the line between “cooked chicken” and “super dry chicken,” so I loved your tips!! 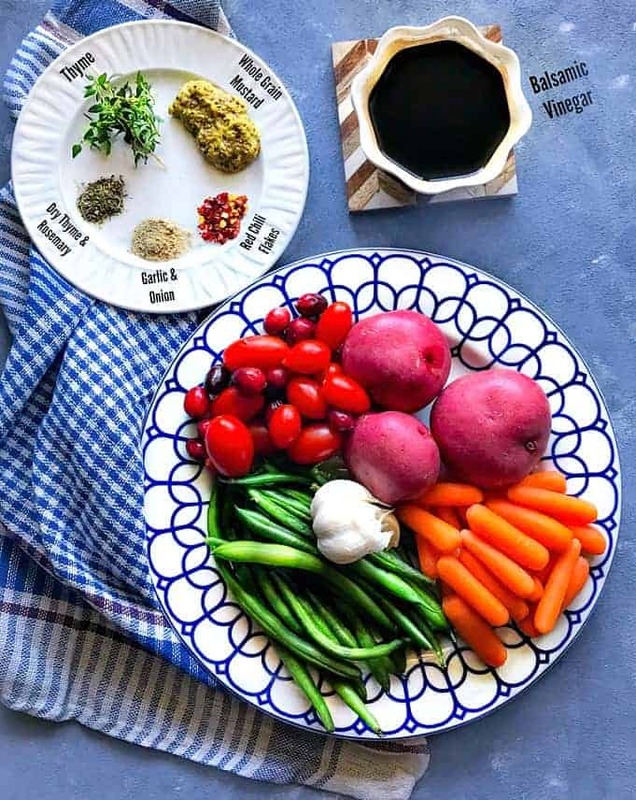 This looks so delicious!I love balsamic vinegar with my chicken, and the vegetables make it even more of a healthy meal! 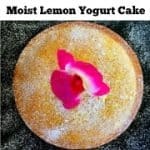 I love that this recipe is gluten free! What an awesome pairing! I’m excited about this recipe. I love the marinade. Sounds like a meal my whole family will enjoy. Can’t wait to try it over Christmas Break. I love the flavors in this simple, but delicious looking roast chicken – yum!